Ukranian-born Jewish émigré painter, sculptor, set designer, theorist and art critic Boris Aronson was a pioneer at the forefront of the international modernist movement. He studied in Kiev including under Alexandra Exter and became a fervent advocate for the creation of a new Jewish Yiddish culture. 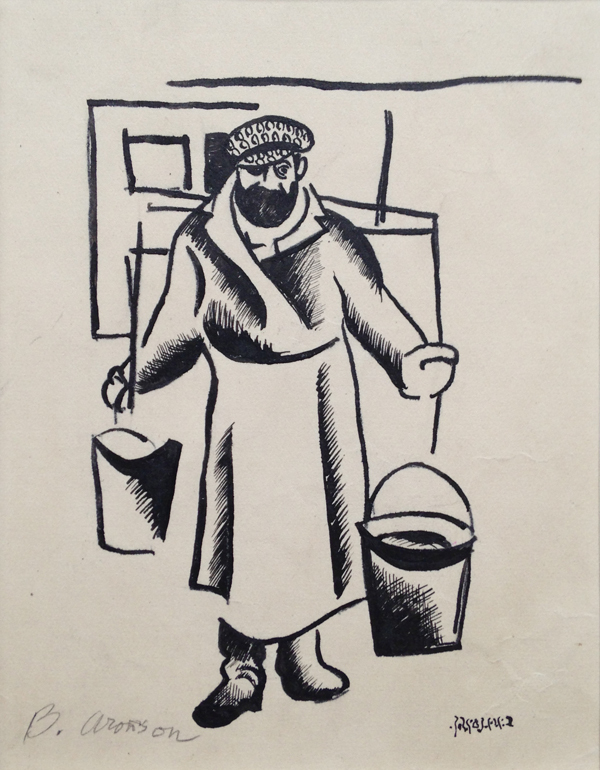 In 1919, with Ryback, Aronson co-published one of the first manifestos of progressive Jewish art in the Yiddish journal 'Oyfgang' ('Paths of Jewish Painting'), giving special mention to Marc Chagall. In autumn 1921 Aronson left to work briefly or the Moscow Jewish Chamber (Kamerny) Theatre, assisting Exter in the creation of set designs, and meeting Chagall. The following year Aronson joined relatives in Berlin and studied in the workshop of the engraver Hermann Struck; his experimental xylographs (woodcuts) were included in the 'First Russian Art Exhibition' organised by the gallery Van Diemen, Berlin. Aronson also published two books: 'Marc Chagall' (Berlin: Pertropolis, 1923) and 'Contemporary Jewish Graphics' (1924). Afterwards, in Paris, he designed sketches and costumes, before settling in New York in 1923 and becoming the leading designer for the city’s Jewish theatres, firstly, for the experimental (Unzer Teater) Unser Theatre in the Bronx, then most notably, as a collaborator with Maurice Schwartz in the Yiddish Art Theatre. From 1930 onwards Aronson was one of the Broadway theatre’s best-known and most prominent designers, creating multiple award-winning sets and costumes for nearly 100 plays, operas, ballets and musical comedies. He married his assistant Lisa Jalowetz in 1945 and she continued to work with him throughout his career; Aronson died in New York in 1980.